Clouds are fascinating to look at and people would even just look at the sky and use their imaginations to see images like ponies and trees. But of course, these are all just within the imagination of the person seeing it and there's no scientific basis for it. However, clouds have classifications and they come in different shapes and sizes. The four major types of clouds are: cirrus, cumulus, stratus, and nimbus. Cirriform clouds are composed of cirrus or cirro clouds. In Latin, cirro means curl. These clouds appear as thin and wispy strands in the sky. They are often called a “mare’s tail” or “children’s hair” because of their close resemblance to hair strands. If you see clouds that look like curly hair, you can be sure that those are cirrus clouds. Cirrus clouds can be white or faint gray. They usually form at altitudes of 16,500 feet in the temperate regions and 20,000 feet in the tropic regions. 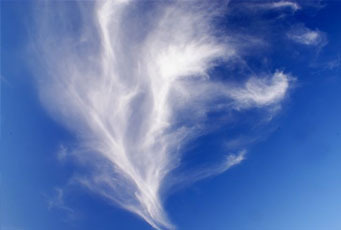 Cirrus clouds form due to the deposition of water vapor. Cirrus clouds can also form due to the outflow of tropical cyclones. This type of cloud is a good indicator of weather changes because they arrive before frontal weather disturbances and tropical cyclones. Once you see cirrus clouds in the sky, there will probably be poor weather coming soon, in the form of light precipitation or falling streaks of ice crystals that will immediately evaporate before it even hits the ground. While cirriform clouds look pretty in the sky, they still look fascinatingly different when visible light interacts with its ice crystals. It can produce fire rainbows, sundogs, and glories. Jet stream cirrus clouds are also a sight to see because they stretch across continents. This cloud seems like it is never-ending. Moreover, cirrus clouds are said to be found in other planets besides Earth. You can see it in Jupiter, Neptune, Saturn, Mars and Uranus. Meteorologists have found cirrus clouds in one of Saturn’s moons called the Titan. However, these cirrus clouds are quite different with the cirrus clouds on Earth because of its composition. Here, cirrus clouds are made from water vapor and ice crystals while in Titan, it is made of ammonia and methane ice. Cirriform clouds vary in thickness. Some measure 330 feet while others are as huge as 26,000 feet. The average thickness of a cirrus cloud is 4,900 feet. On average, cirrus clouds have 30 ice crystals per liter or 96 ice crystals per gallon. The length of each ice crystal is .25 millimeters but can be as small as .1 millimeters and as big as several millimeters. Temperature of cirrus clouds can vary from -4 °F to -22 °F. Ice crystals of cirrus clouds come in different shapes and sizes. This depends on how the cirrus cloud is formed. Some of the shapes you can see are conglomerations, hollow columns, solid columns, rosettes, and plates. The shape of the ice crystal depends on the ice saturation, atmospheric pressure and air temperature. In temperate regions, cirrus clouds are usually segregated and appear in columns and plates. They are positioned on top of the cloud. Rosettes and conglomerate shapes are near the base of the cloud. In the North Arctic Region, cirrus clouds appear in column, rosettes and conglomeration shapes. The ice crystals on these cirrus clouds are 4 times bigger than the average size. In Antarctica, cirrus clouds appear in columns. These columns are longer than those that can be seen in other continents. Cirrus clouds raise the temperature of air beneath it by 10 °C. Because of this, cirrus clouds become cirrostratus clouds. In high altitudes, when convection occurs in cirrus clouds, they become cirrocumulus clouds, which can produce light precipitation. Cirrus clouds are used as indicators of weather conditions that are about to arrive in the area. Meteorologists ignore isolated cirrus clouds but instead, fully focus on large cirrus cloud formations. This is an indication of a weather disturbance in the high altitude. Large numbers of cirriform clouds that start to form are usually signs of a coming storm. A cloud like cirrus castellanus indicates instability in the higher altitude. When this cloud deepens and starts to spread, cirrus radiatus and cirrus fibratus will form. These clouds indicate an arriving weather front. Now if the weather front is a warm front, cirrus clouds become cirrostratus clouds. While spreading, they thicken and form altocumulus or altostratus clouds. After that, nimbostratus clouds start to form and you’ll know that heavy rain will start to pour. On the other hand, if a cold front is arriving, cumulonimbus clouds will form from the cirrus clouds. The two major sub-types of cirrus clouds are cirrocumulus and cirrostratus clouds. To help you understand them, take note that the cirrocumulus cloud formation is a combination of cirrus and cumulus clouds. These clouds will appear in patches and they will not cast any shadows. Further, these clouds will appear in rows and rippling patterns with clear spaces in between the rows. However, when the patches start growing larger, this indicates instability in the high altitude and would mean that poor weather is fast approaching. Cirrocumulus clouds immediately changes into cirrus clouds due to the continuous water vapor deposit in the ice crystals. It becomes heavy and starts to fall, which in turn, destroys the upward convection. Cirrocumulus clouds have 4 species, and these are: floccus, castellanus, lenticularis, and stratiformis. The other sub-type is the cirrostratus cloud, which appears like milky sheen. Cirrostratus clouds look similar to altostratus clouds but you can distinguish one from the other because the sun and moon can still be visible through cirrostratus clouds. Cirrostratus clouds are formed when moist and warm air rise up. Once these clouds form precipitation will occur within 12 to 24 hours. It has two species: fibrates and nebulosus.